Irish wannabes… aren’t we all? My cousin Donna is occasionally annoyed with my abject failure as one of the family’s genealogists to prove the one thing every one of us wants to believe every year on March 17th. She wants me to prove that we’re Irish. Trust me, I’d love to be Irish. Okay, so I don’t much care for warm Guinness (not even on St. Paddy’s Day), and corned beef and cabbage won’t find much of a place on my table, but I fell desperately in love with all the Many Faces of Ireland on a two-week vacation there some years back. 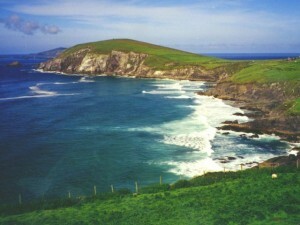 The Dingle Peninsula (left). The Lake Country. The Ring of Kerry. Connemara. The Barony of Erris. Oh yeah, I could happily be Irish. Even a little bit Irish. The hitch is, we’re probably not, at least not very much. If we are, it’s much more likely to be Scots-Irish than Irish-Irish. And it isn’t within the last, oh, 235 years or so anyway. If that. Today’s Google doodle is more Irish than we’ll ever be. Now mind you there’s not one shred of evidence that William Killen was born in Ireland. I’ve seen Ireland as his birthplace in all the online family trees that include this William, I’ve seen family histories written by William’s great grandson, I’ve seen interview notes with my own grandmother who described the Killen family as Irish and her grandmother, who descended from the Killens, as a fiery-tempered redhead, and I’ve seen that description lead my mother to write Ireland in my baby book as the birthplace of that Killen-descended redhead. And nobody, anywhere, at any time, has cited anything even vaguely resembling a source. So all we know for certain besides his arrival in Mississippi between 1808 and 1810 is that William was in Wayne County, Mississippi, in 18202 and Rankin County, Mississippi, in 1830.3 He is supposed to have died around 1834 in Rankin County. I don’t know that it’s going to be impossible to see if we have Irish ancestors among our Killens. I’m sure I could track down a Killen cousin for DNA testing, and I really should get around to that. But there’s just no way now to be certain, from the little information we have, that William Killen was any flavor of Irish much less Irish-Irish. Hey it works for me… at least once a year, every year, on March 17th. Killen is an Irish name. I’m a Killen descendant, but not from the South. I did the work for my Killens of New Brunswick, Canada. Good luck with yours. I hope we turn out to be Irish at least a little, Martin! If only to make my cousin feel better!